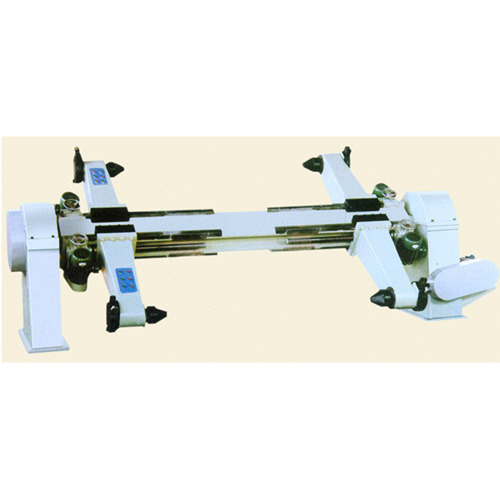 The structure is double rolls with four arms mill rolls on both arms can be bearing at the same time. Hydraulic control of lifting, lowering, clamping and centering. Wev tension is controlled by pneumatic or magnetic power tension control, expendable chucks is optional. Established in year 2001, we, SARO PACKAGING MACHINE INDUSTRIE, are one of the leading manufacturer and exporter of industrial machinery and includes packaging machinery, printing machinery, Corrugation Machine, Corrugated Machinery Paper Corrugation Machine Paper Converting Machine Die Punching Machine Heavy Duty Die Punching Machine,corrugation Box Making Machine, Corrugated Board Making Machine, Corrugation Machine, Dual Profile Paper Corrugation Machine, Single Facer Paper Corruagtion Machine, Oblique Paper Corrugatour, Bearing Mounted Corrugation Machine, Rotary Slotter, Folder Gluer, Semi Automatic Folder Gluer, Automatic Folder Gluer, Die Punching Machinery, packaging machinery and converting machineries, heavy duty die punching machine and flat bed punching machine, with a good experience and goodwill for more than a decade. We have been successful in catering a distinct niche for ourselves in the domestic market. Assured commitment to deliver quality products that adhere to the customer specifications has earned us an invaluable reputation in the domestic market.Owing to this approach, we have been able to win the loyalty of a huge number of clients such as M/S. Selvambigai Packing, Vijayamangalam, M/S. Flower Knitting Mills, Tirupur, M/S. Surya Apparels, Tirupur, M/S. Texcity Packers, Karur Landakottai, M/S. Jupiter Packaging Industries, Podanur, Coimbatore, M/S. Dura Packs, Pollachi, M/S. Sri Packs, Karur, M/S. Delta Pack, Karur and many others.